Like many live code playgrounds, CodePen lets you learn in an open-source environment, displaying a live preview of the code changes, and even letting you embed your CodePen demos on any web page, like the one below. See the Pen Full CSS NES by One div (@onediv) on CodePen. In this article I’ll go beyond those features just mentioned to explain some of the things that I think puts CodePen above its competition, and why you should check it out if you haven’t done so already. While explaining these features, I’ll also embed some random but cool pens in each section for you to check out. CodePen includes some awesome features to write CSS faster. 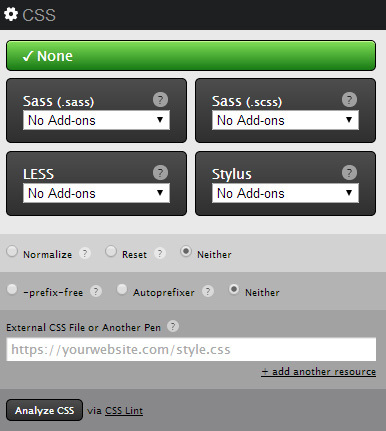 You can select to include Normalize.css or Reset.css in your CSS by simply clicking a radio button. You can also choose to use -prefix-free or Autoprefixer as well. This way there is no need to take the time to link to an external file (which is also possible, if you wanted to). What if you aren’t sure about some of your CSS techniques being used? Don’t worry; CodePen has CSSLint integration to search through your CSS code and warn you if there are errors, warnings, poor browser support, etc. CodePen is all about faster and smoother development. That’s why they utilize toolkits such as Emmet to help keep projects moving. The CodePen editor allows you to use Vim Key Bindings which are command-line keyboard shortcuts. Both of these tools together can help to create a faster workflow. To learn more about Emmet, you can check out the article Faster Workflow: Mastering Emmet. You can add tags to your pens, which then become searchable. Searching tags such as “Loader” and “Form” brings up tons of helpful inspiration. If you want, you can even create collections of pens relating to a certain topic. Chris Coyier, one of the co-founders of CodePen, has created collections such as “Path Drawing” and “Repeating Patterns“. CodePen has a total 8 different views for pens. Each view has its own advantages. Editor View – This is the default view for editing pens. You can adjust the size of the code previewer and select which languages to display. Details View – This view allows you to see the pen’s tags, hearts, comments, forked pens, etc. 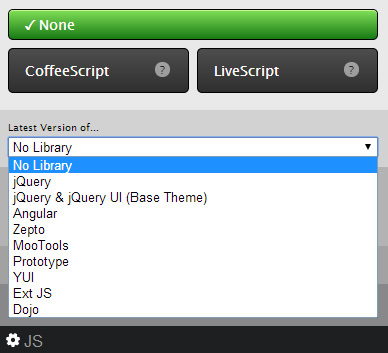 This contains most of the social features for CodePen. Full Page View – This is pretty self-explanatory. It makes your pen full-screen within an iframe, leaving only a CodePen footer. Presentation Mode – This mode is made especially for overhead projectors. It removes the header to give you more room and allows you to quickly change the font size and colors of the code editor. You can also change the size of the previewer without changing code. Live View – With CodePen Live View, you have a full-screen display of your pen. As you edit that pen, it will automatically update as you type. This is often used when testing on multiple devices. Professor Mode – This mode allows people to watch you code in real-time. There is also a chat window where the professor and students can chat. Collab Mode – Collab mode allows more than one programmer to make edits to a pen at the same time. There is also a chat window, just like in professor mode. 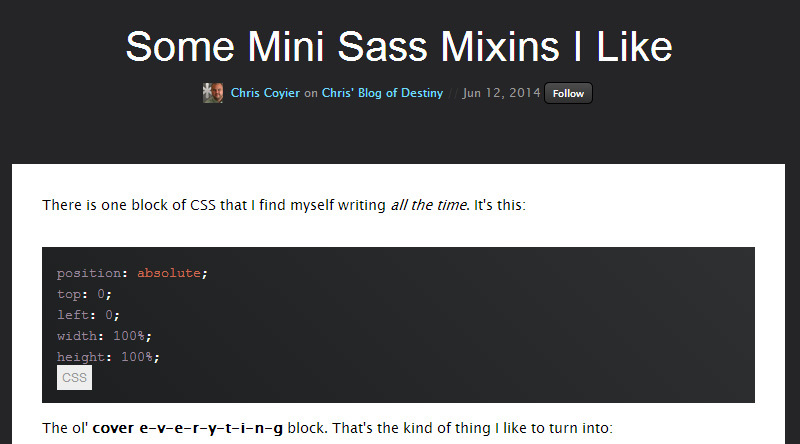 Blogging is a new feature on CodePen, allowing you to easily write about code just like on a regular blog. You can write with Markdown, and use a special embedding tool to embed your pen when you need to. You can add custom CSS to your posts, and there is a super simple preview to test out your post. This is what sets CodePen ahead of the competition by a long shot. Community has been a huge part of CodePen since the beginning. Through comments and sharing, people can give and receive constructive criticism, and learn together. Groups such as 4ae9b8 and Bullgit have started from conversations through CodePen. The founders have talked about what they think about the CodePen community on the CodePen Podcast.